· 2.x: currently at v. 2.2.4, the second generation drops Internet Explorer 6-8 support, it’s slimmer compared to its predecessor, and it offers the same API’s. · 3.x: currently at v. 3.1.1, and the latest version of the library covered in this article. jQuery 3 was released in June 2016. As of today, we can say that the jQuery foundation implements only jQuery 3.0. The previous versions are supported only for critical patches. Sometimes you may feel that jQuery has some features you don’t need in your application, the most common are jQuery ajax and animation that can be handled by other plugins. jQuery 3.0 now has a “slim” version that excludes these modules. Let us discuss some salient features of this release. jQuery.Deferred objects have been updated for compatibility with Promises/A+ and ES2015 Promises. An exception thrown in a .then() callback now is a rejection value. In previous jQuery versions, exceptions bubbled all the way up, aborting callback execution, and irreversibly locking both the parent and child Deferred objects. The resolution state of a Deferred created by .then() is now controlled by its callbacks; exceptions become rejection values and return values of functions that are not a then become fulfillment values. In previous jQuery versions, returns from rejection handlers became rejection values. Callbacks are always invoked asynchronously. In previous jQuery versions, they would be called immediately upon binding or resolution, whichever came last, with all the related pain (you know what I am saying). Run this code in a browser and check the console. In jQuery 3, this will log “parent resolved” before invoking any callback, each child callback will then log “fulfilled child”, and the grandchildren will be rejected with Error “grandchild”. In previous jQuery versions, this would log “rejected child” (the child Deferred having been rejected instead of fulfilled) once and then immediately terminate with uncaught Error “grandchild” (“parent resolved” not being logged and the grandchildren remaining unresolved). jQuery.when has been updated too in order to accept any object that can be used in then callback, which includes native Promise objects. If for some reason you can’t accept or change your code to follow this new, and a more precise way to handle promises, you can restore the previous behavior by replacing any use of .then() with the deprecated .pipe() method (which has an identical signature). The catch() method was added to promise objects as an alias for .then(null, fn). Finally the deprecated load, unload and error, deprecated since jQuery 1.8; are now removed. Remember that the correct method to register an event handler in jQuery is on, and the opposite off. Previous jQuery versions always return “something” instead of throwing errors. This can be frustrating because an obvious logical error returns an empty result, which is difficult to handle appropriately. jQuery 3 in similar scenarios now throws an exception, which can be handled accordingly. jQuery 3.0, if the browser supports it, uses requestAnimationFrame API to perform animations. The API uses GPU to perform animations. This method is powerful because it’s faster and smoother while performing animations, and on mobile devices, it’s a battery saver. It is not the first time that jQuery developers have tried to use requestAnimationFrame for animations, but in order to apply it correctly, some code assumptions need to be refactored. The main problem is that requestAnimationFrame is not performed when the browser tab is not active, so jQuery must handle the animation stack correctly. jQuery offers some custom selectors (like :visible and :hidden) that apparently look like a CSS selector, but are resolved by jQuery selector engine. The developers found that with these selectors, some extra work can be skipped if used multiple times in the same document. After they optimized it in jQuery 3, the result is now ~17 times faster. :visible and :hidden custom selectors can still be expensive because they are based on how each browser implements the DOM flow rendering. This means that sometimes these selectors ask a complete flow recalculation of the whole page, so they must be used with responsibility. jQuery 3.0 changes the meaning of :visible (and therefore of :hidden) selectors. Starting with jQuery 3.0, elements will be considered :visible if they have any layout boxes, including those of zero width and/or height. For example, br elements and inline elements with no content will be selected by the :visible selector. Until jQuery 3.0, the unwrap method did not take any argument. The .unwrap() method removes the element's parent. This is effectively the inverse of the .wrap() method. The matched elements (and their siblings, if any) replace their parents within the DOM structure. With jQuery 3.0 a selector can be passed to the method in order to check the parent element. If an element parent does not match the selector, the element will not be unwrapped. Today almost all modern browsers support strict mode. jQuery 3.0 has been developed with this in mind. 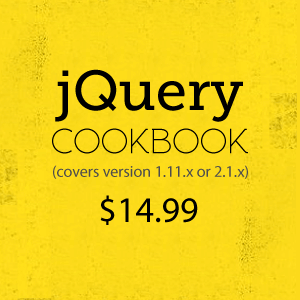 This does not imply that you have to rewrite your existing jQuery code. Although jQuery 3.0 has been written in strict mode, it’s not mandatory to have all your code strict mode compliant. jQuery 3 opens the door to new features and performance advantages. jQuery 3.0 supports the for…of statement. This iterator is part of ECMAScript 6. It gives a more readable way to loop over iterable objects, such as Arrays, Maps, and Sets. In jQuery 3.0, the for...of loop can be used to replace the $.each(...) usage. jQuery 3.0 give us the new $.escapeSelector(). The method allows to escape characters that have a different usage as CSS selector, and result in a wrong selection. This method is particularly useful when a class name or an ID contains characters that have a special meaning in CSS, such as the dot or semicolon. Such characters usually occur in legacy applications or auto-generated code. Now instead of using escaping functions, we have the jQuery official one. jQuery 3.0 added an extra security layer for protection against Cross-Site Scripting (XSS) attacks. Cross-site scripting (XSS) is a security exploit which allows an attacker to inject into a website malicious client-side code. This code is executed by the victims and lets the attackers bypass access controls and impersonate users. According to the Open Web Application Security Project, XSS was the third most common Web app vulnerability in 2013. This new layer requires the developers to specify dataType: 'script' in the options of $.ajax() and $.get() methods. Now when you make a request for a script on a domain different from yours, you must now explicitly declare this in the options. jQuery get() and post() are shorthand for the ajax() function used often to simplify an Ajax call. In jQuery 1.0, the ajax() function can receive a set of key/value pairs that configure the Ajax request. This was not possible with get() and post(). jQuery 3.0 adds this signature for the $.get( ) and the $.post( ) in order to align them to $.ajax( ). Obviously the type option will be ignored and set accordingly from the shorthand function. jQuery has never fully supported SVG and probably this will never change. With jQuery 3.0 methods for CSS class manipulation, .addClass(), .removeClass() and .hasClass() can now be used to manipulate SVG. Prior to jQuery 3.0 you had to access class attribute as any other attribute, losing the power of jQuery class manipulation functions. Now jQuery can be used to find an SVG element and style the classes with CSS. Before jQuery 3, the jQuery library returned rounded int values with width(), height() and related methods. jQuery 3 now return a floating number; this is particularly relevant when you have to work with exact values on layout and DOM manipulation. With jQuery 3 the methods .bind(), .unbind(), .delegate() and .undelegate() are deprecated and they might be removed in future releases. As said previously, the correct method to register an event handler is jQuery is on and the opposite off. jQuery 3 brings in a lot of new features to the library. All the code needed to support legacy browsers is finally removed, and the code is reengineered to use and support modern features.